A long, steep climb with sweeping hairpin bends on good tarmac – given the name The Alpine Climb – started the day well. Then came the descent, and on through remote countryside across rolling hills with fields of Cassava vegetable being harvested, taking us to an unusual lunch-spot. 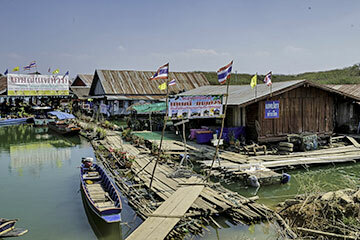 A floating group of wooden huts under corrugated iron roofs connected by walkways, where fried chicken, salads, various rice dishes were laid out, giving the opportunity for the rally to regroup and discuss the morning’s competition while afloat on a giant reservoir. Reaching this restful spot involved taking in a Regularity test set in the middle of the Alpine Climb. Only two cars managed to achieve a spot-on zero penalty on this average-speed-section, Michael and Ann Wilkinson in their Alvis, achieving the best result in the Vintage category, and Paul and Sandra Merryweather in their Mercedes also getting a spot-on result, the best of the Classics. Bill Shields, leader of the Vintageants, dropped five seconds, their second-placed challenger, the Chevy of Phil Garratt, dropped two; Daniel Day holding third overall dropped three, and notable performances were chalked up by Lars Rolner and Mike Butler, again doing well dropping just a single second. The leaders of the Classic saw no change, with Peter Lovett and Gerry Crown both on equal, scoring the same four seconds penalty and Grand Tromans losing six. Rob Garnsworthy and John Rich again going well, both drivers dropping a single second, so too did Brant Parsons and Stan Gold in their Porsche 911. Marc Buchanen, Ford Mustang, and Nicholas Pryor, Volvo PV544, dropped two seconds. After a fine lunch afloat, it was on to our hillclimb. We had to run around a bit to find the Park Rangers who had promised to close the road for 12 kilometres of graded hard-baked dusty dirt, twisting its way up the side of a mountain through dense rain-forest. Once official support was on hand, the fun began, with locals being held from driving down against rallycars forming a big bunch of spectators at the finish-line. With high banks on each side, and every full-on bend tightening up into the next corner, it was a switchback of a track that steadily rose up the mountain side from a green valley, thick clouds of dust hanging in the air. The Mercedes Ponton of Clemens and Agneta Lansing proved an early casualty when they broke an axle half-shaft , and had to be towed to the top of the hill. They were to come down off the mountain behind the tow-rope of Andy Inskip and Tony Jones, in their mobile-workshop, and quickly located spares for an over-night repair. Best time on the climb was set down by the two-litre 911 of Peter Lovett, who set a time of 7 minutes 27 seconds, just one second quicker than the V8 Leyland of Gerry Crown. The Datsun still holds third overall in the Classics but Grant Tromans was not looking pleased with himself having set a time of 7:54, having first-gear issues leaving the start-line. 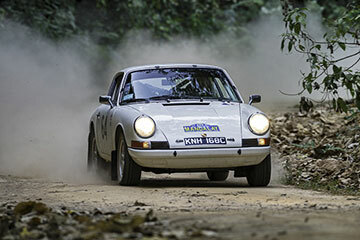 Held in bright sunshine, the mountain climb proved particularly dusty, and the interval between each car leaving the start had to be extended to help drivers enjoy a reasonably dust-free drive. We then descended for over an hour of twists and turns down to the valley below and the drive to our hotel in Phrae.